Today is the birthday (1892) of John Ronald Reuel Tolkien, CBE, English writer, poet, and philologist, best known as the author of The Hobbit and The Lord of the Rings. He served as the Rawlinson and Bosworth Professor of Anglo-Saxon at my Oxford college, Pembroke, from 1925 to 1945, and in his last years when I was in residence he was often seen at dinner. I had the good fortune to meet him in 1971. His celebrity status as a fantasy writer was in its early phases back then because his books did not gain popularity until the 1960’s. Nonetheless, we were amazed to be able to talk to him. By then he looked like a gnarly old tree from Middle Earth. There is no real need to talk about his well-known books. Instead I will give you (in synopsis) two aspects of his life that are less well known: his service in the army in the First World War, and his linguistic scholarship. In 1914 when the United Kingdom entered the First World War, Tolkien’s relatives were shocked that he did not immediately volunteer for the British Army. In a 1941 letter to his son Michael, Tolkien recalled, “In those days chaps joined up, or were scorned publicly. It was a nasty cleft to be in for a young man with too much imagination and little physical courage.” Instead, Tolkien endured the family and public scorn and entered a university program that allowed him to delayed enlistment until completing his degree. By the time he passed his Finals in July 1915, Tolkien recalled that the hints were, “becoming outspoken from relatives.” So he volunteered as a Second Lieutenant in the Lancashire Fusiliers. He trained with the 13th (Reserve) Battalion on Cannock Chase, Staffordshire, for eleven months. In a letter to his fiancée, Edith, Tolkien complained, “Gentlemen are rare among the superiors, and even human beings rare indeed.” They were married soon after and lived near the training camp. On one occasion I spent the night with the Brigade Machine Gun Officer and the Signals Officer [Tolkien] in one of the captured German dugouts … We dossed down for the night in the hopes of getting some sleep, but it was not to be. We no sooner lay down than hordes of lice got up. So we went round to the Medical Officer, who was also in the dugout with his equipment, and he gave us some ointment which he assured us would keep the little brutes away. We anointed ourselves all over with the stuff and again lay down in great hopes, but it was not to be, because instead of discouraging them it seemed to act like a kind of hors d’oeuvre and the little beggars went at their feast with renewed vigour. Tolkien’s time in combat was a terrible stress for Edith, who feared that every knock on the door might carry news of her husband’s death. To get around the British Army’s postal censorship, the Tolkiens developed a secret code for his letters home. By using the code, Edith could track her husband’s movements on a map of the Western Front. 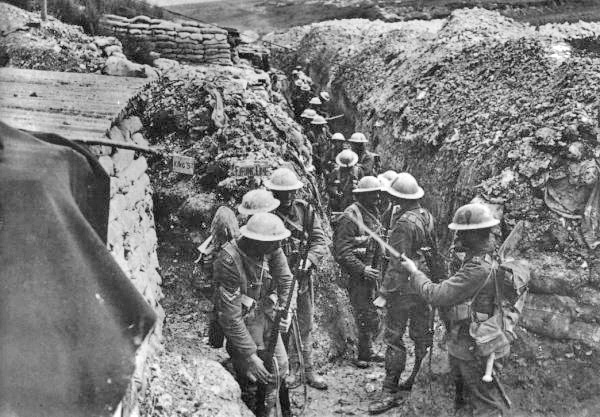 On 27 October 1916, as his battalion attacked Regina Trench, Tolkien came down with trench fever, a disease carried by lice. He was invalided to England on 8 November 1916. Many of his dearest school friends were killed in the war. Among their number were Rob Gilson of the Tea Club and Barrovian Society, who was killed on the first day of the Somme while leading his men in the assault on Beaumont Hamel. Fellow T.C.B.S. member Geoffrey Smith was killed during the same battle when a German artillery shell landed on a first aid post. Tolkien’s battalion was almost completely wiped out following. Tolkien might well have been killed himself, but he had suffered from health problems and had been removed from combat multiple times. Although Kitchener’s army enshrined old social boundaries, it also chipped away at the class divide by throwing men from all walks of life into a desperate situation together. Tolkien wrote that the experience taught him, ‘a deep sympathy and feeling for the Tommy; especially the plain soldier from the agricultural counties.’ He remained profoundly grateful for the lesson. For a long time, he had been imprisoned in a tower, not of pearl, but of ivory. One has indeed personally to come under the shadow of war to feel fully its oppression; but as the years go by it seems now often forgotten that to be caught in youth by 1914 was no less hideous an experience than to be involved in 1939 and the following years. By 1918 all but one of my close friends were dead. 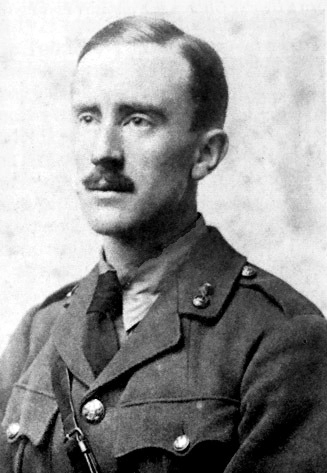 A weak and emaciated Tolkien spent the remainder of the war alternating between hospitals and garrison duties, being deemed medically unfit for general service. I never called Edith Luthien – but she was the source of the story that in time became the chief part of the Silmarillion. It was first conceived in a small woodland glade filled with hemlocks at Roos in Yorkshire (where I was for a brief time in command of an outpost of the Humber Garrison in 1917, and she was able to live with me for a while). In those days her hair was raven, her skin clear, her eyes brighter than you have seen them, and she could sing – and dance. But the story has gone crooked, & I am left, and I cannot plead before the inexorable Mandos. This incident inspired the account of the meeting of Beren and Lúthien and these names are inscribed on their headstone. Tolkien’s first civilian job after World War I was at the Oxford English Dictionary, where he worked mainly on the history and etymology of words of Germanic origin beginning with the letter W. He wrote that he struggled mightily with “walrus.” In 1920, he took up a post as Reader in English Language at the University of Leeds, and became the youngest lecturer there. While at Leeds, he produced A Middle English Vocabulary and a definitive edition of Sir Gawain and the Green Knight with E. V. Gordon, both becoming academic standard works for several decades. He also translated other Old English works In 1925, he went to Oxford as Rawlinson and Bosworth Professor of Anglo-Saxon, with a fellowship at Pembroke College. During his time at Pembroke he wrote The Hobbit and the first two volumes of The Lord of the Rings. He would come silently into the room, fix the audience with his gaze, and suddenly begin to declaim in a resounding voice the opening lines of the poem in the original Anglo-Saxon, commencing with a great cry of Hwæt! 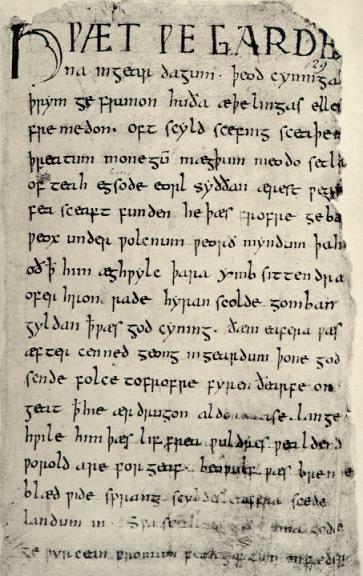 (The first word of this and several other Old English poems), which some undergraduates took to be ‘Quiet!’ It was not so much a recitation as a dramatic performance, an impersonation of an Anglo-Saxon bard in a mead hall, and it impressed generations of students because it brought home to them that Beowulf was not just a set text to be read for the purposes of examination, but a powerful piece of dramatic poetry. I don’t think that I have ever told you what an unforgettable experience it was for me as an undergraduate, hearing you recite Beowulf. The voice was the voice of Gandalf. 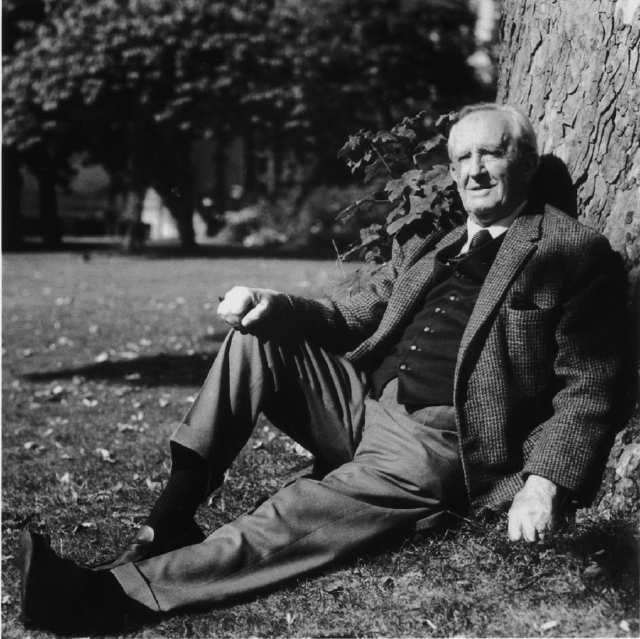 Tolkien learned Latin, French, and German from his mother, and while at school he learned Middle English, Old English, Finnish, Gothic, Greek, Italian, Old Norse, Spanish, Welsh, and Medieval Welsh. He was also familiar with Danish, Dutch, Lombardic, Norwegian, Russian, Serbian, Swedish and older forms of modern Germanic and Slavonic languages, and started constructing his own languages as a teenager. A true linguist! Since Tolkien’s primary academic interest was Old English it seems right to give you an Anglo-Saxon recipe. This one has been reconstructed from 7th century descriptions. It’s pretty simple and delicious. You can use rabbit in place of hare. Heat the butter on medium high heat in a heavy saucepan and sauté the garlic and leeks until softened. Reserve them. Joint the hare and brown with what remains of the butter. Return the leeks and garlic to the pot. Add the barley, vinegar, bay leaves and sage, plus salt and pepper to taste. Cover with water or light stock. Bring the pot to the boil and then simmer gently, covered, for at least 1 ½ hours. 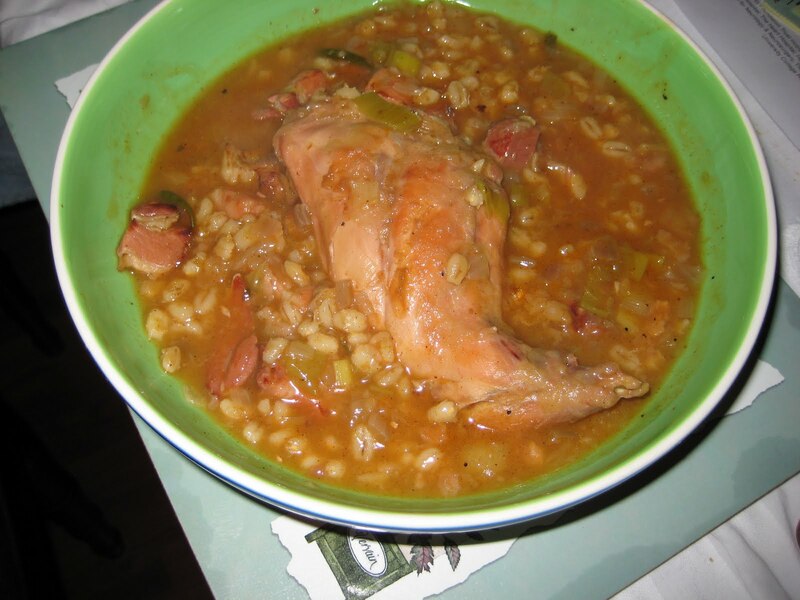 Make sure the barley is thoroughly cooked and the hare is tender. Adjust the seasonings and serve in deep bowls with wholewheat bread. Wonderful tribute to Tolkien! Thank you. Should not the recipe begin with: “First, catch your hare”?